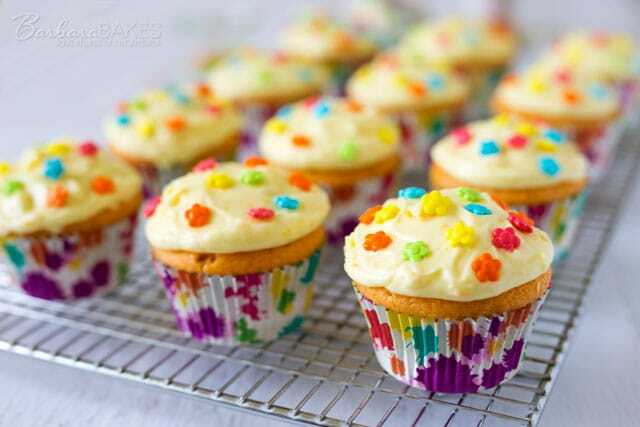 Orange Creamsicle Cupcakes with a fun orange soda cupcake frosted with a luscious, sweet orange cream cheese icing. This post first appeared last year on Sweet Basil as a guest post when Carrian was taking care of herself and her little baby bump. Now that warm weather is here again, I thought it was the perfect time to share the recipe on Barbara Bakes. My inspiration for recipes comes from many different places. Some times it’s a request from reader or a friend. Sometimes it’s a dessert I’ve had in a restaurant, or seen in a magazine. Sometimes it’s a new ingredient I found at the store. But these cupcakes were inspired by the cute cupcake liners and sprinkles I found at Zurchers. I just couldn’t resist buying them even though I didn’t have a recipe in mind for them yet. They were just so colorful and happy. I brought them home and left them on the counter for a few days waiting for inspiration to strike. Then I remembered the fun orange soda cakes I’d seen several bloggers post and decided they’d make a great colorful cupcake. 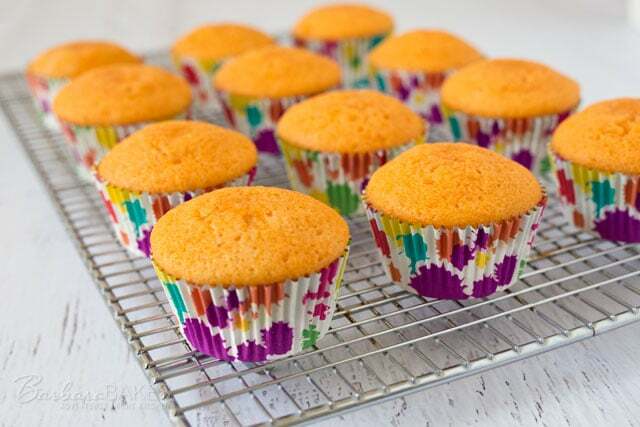 This Orange Creamsicle Cupcakes recipe is adapted from a lemon cupcake recipe from a cookbook I recently reviewed, The United States of Cakes. I liked that the recipe only makes 12 cupcakes. Having two dozen cupcakes in the house is just too tempting when I’m going to be home alone with them. I added orange food coloring to the batter so they’d be a darker orange color, but feel free to omit it if you’d rather. I liked the orange cupcake, it’s light and fluffy with a mild orange flavor. But I LOVED the frosting. It’s rich and cream and has a great orange flavor. Preheat oven to 325°. Line cupcake pan with paper liners. Using an electric mixer, cream together butter and sugar on medium-high speed until fluffy. Mix in the eggs one at a time. Add orange soda and food coloring if using; mix just until blended on low speed. Bake for 20 minutes or until toothpick inserted in center comes out clean and the cupcake springs back when touched. Remove from oven and cool for 5 minutes. Remove from pan and cool on a wire rack completely before frosting. Beat cream cheese, butter, zest, and orange juice until creamy. Beat in powdered sugar until smooth and creamy. Add additional powdered sugar or orange juice if necessary. 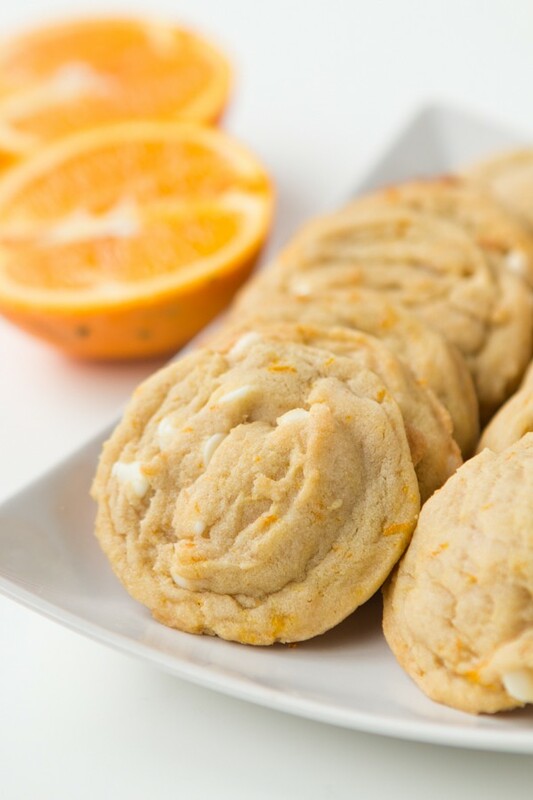 For more orange creamsicle goodness, check out Carrian’s Orange Creamsicle Cookies and all her delicious, family-friendly recipes. Orange creamsicle is one of my favorite flavors. Love that there is orange soda in these. Very cute looking too! Those look super delicious, Barbara……you sure can’t go wrong with orange cupcakes and orange cream cheese frosting….Mmmmmmm. It’s so nice of you to take care of her site while she’s gone. 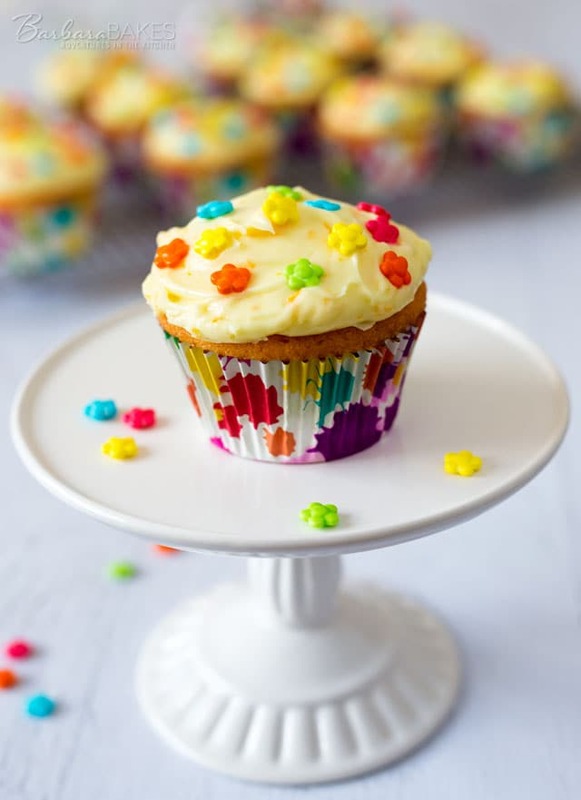 Especially when it’s this delicious orange cupcakes! These look like absolute perfection!